1. Cut the fish into 1-inch cubes and toss with the garlic, lime juice, olive oil and jalapeno. Cover and chill for 20 minutes. While the fish is marinating, prepare the ingredients for assembly. 2. Preheat your grill on medium high. Skewer the marinated fish onto the bamboo skewers and grill uncovered for about 6 minutes total, turning to char evenly on all sides (you may wish to use a grilling screen or basket for the fish, as it may flake, depending on the type of fish). 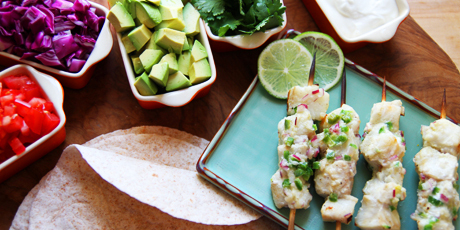 To serve, remove the fish from the skewers by holding a soft taco over the skewer and pulling and then allow your guests to top with the remaining ingredients.